Taxi drivers in Spain dug their heels in and vowed to continue Wednesday a strike against ride hailing competitors such as Uber and Cabify that has paralysed major cities. The strike began in Barcelona last week and spread to Madrid at the weekend as drivers blocked main thoroughfares, demanding action from the government against what they believe is poor enforcement of regulations on VTCs (Tourism Vehicles with Chauffeur). On Monday, it spread even further to cities across the country. 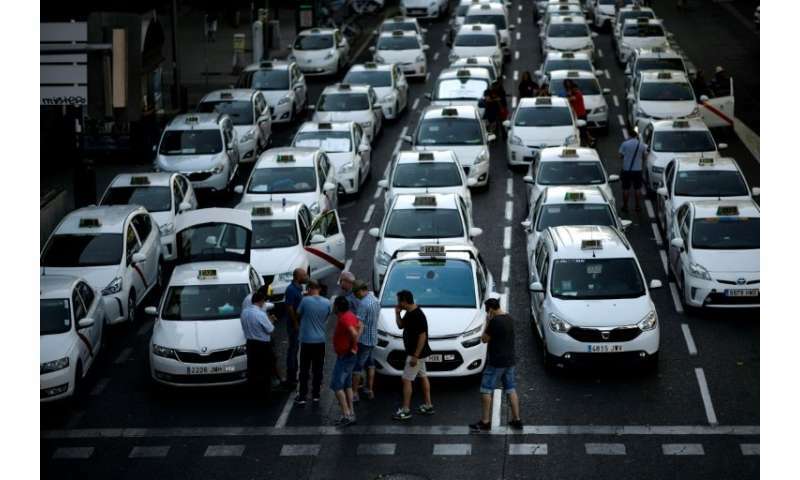 Elite Taxi, one of Spain's taxi federations, tweeted Tuesday that its members and those of other associations had "reached a deal to continue with the stoppage" at least until Wednesday when a transport-related meeting takes place between the government and regional authorities. "We will be able to know more about the government's intentions," it said. The strike mirrors other similar work stoppages in European countries, as taxis across the continent complain ride hailing competitors are threatening their livelihoods, arguing for instance their licences are much more expensive than those for VTCs. In Madrid on Tuesday, white taxis blocked the main Paseo de la Castellana thoroughfare, joined by several Portuguese drivers who had come to show their support, their country's green and red flag draped on their cars. In Barcelona, hundreds of black and yellow taxis remained parked on the Gran Via, one of the seaside city's main roads. The strike started in the tourist magnet of Barcelona on Wednesday after the Spanish government appealed a ruling by the city's authorities that limited the number of licences for Uber-style services. Taxi federations want the authorities to strictly enforce legislation under which there should be 30 traditional taxis for each VTC. VTC drivers have in turn criticised their traditional taxi peers, charging some were attacked in Barcelona last week and arguing they are trying to forcefully retain their monopoly.